The Photo is the ‘Pulitzer Prize’ winning Photo taken in 1994 during the Sudan Famine. The picture depicts a famine stricken children crawling toward an United Nations food camp, located a kilometer away. The vulture is waiting for the child to die so that it can eat it. 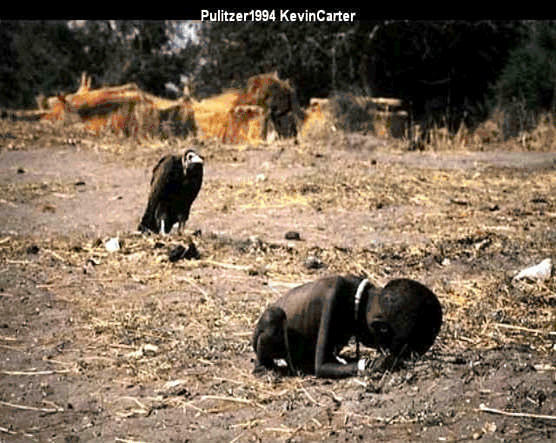 No one knows what happened to the child, including the photographer - Kevin Carter who left the place afterward. Three months later he committed suicide due to depression. The suicide note he left behind is a litany of nightmares and dark visions, a clutching attempt at autobiography, self-analysis, explanation, excuse. He wrote, he was "depressed...without phone...money for rent...money for child support...money for debts...money!! !...I am haunted by the vivid memories of killings & corpses &amp; anger & pain...of starving or wounded children, of trigger-happy madmen, often police, of killer executioners... ". Detail story here. Thanks to Muktomona for the message. I quote here the comment from the editor of Muktomona, Avijit Roy, "Sometimes I feel like Carter that it's better to die in this unequal and unhappy world, rather than living in denial and hypocrisy. Don't you guys sometimes feel the same way as well?"